Okay, it's been awhile, let's be honest. It may be a little confusing as to what exactly is going on in this crazy war of ours. I mean, first off, this campaign was fought entirely in the dwarven lands and not one dwarf made an appearance! Well, let's look at the map, once more re-imagined! Oh, this is going to be fun already! The Horde breaks down into politics more now that they feel secure in their victory against the Alliance. When Dun Modr is taken back, they are caught off-guard. Knowing that Tol Barad is a major roadblock to travel in the dwarven lands, a fully concerted attack is sent against the fortress, and it is eventually taken. Gul'dan and Cho'Gall began to look at the big picture, setting into motion a number of plots. The first involved Cho'Gall getting to Grim Batol, where he presumably conducted more than simple tests on the refineries. Meanwhile, Doomhammer sent his forces against the human town of Stromgarde, now a shell of its former glory. The attack succeeded, but did not stop the diehard Stromgarde soldiers, who did not back down from the war. This victors of this campaign are the humans who have kept themselves from destruction, while pushing at just the proper moment. The Horde was slowly beginning to split between followers of Doomhammer and followers of Gul'dan. While they may not have known it, patience had proven to be the Alliance's best defense. 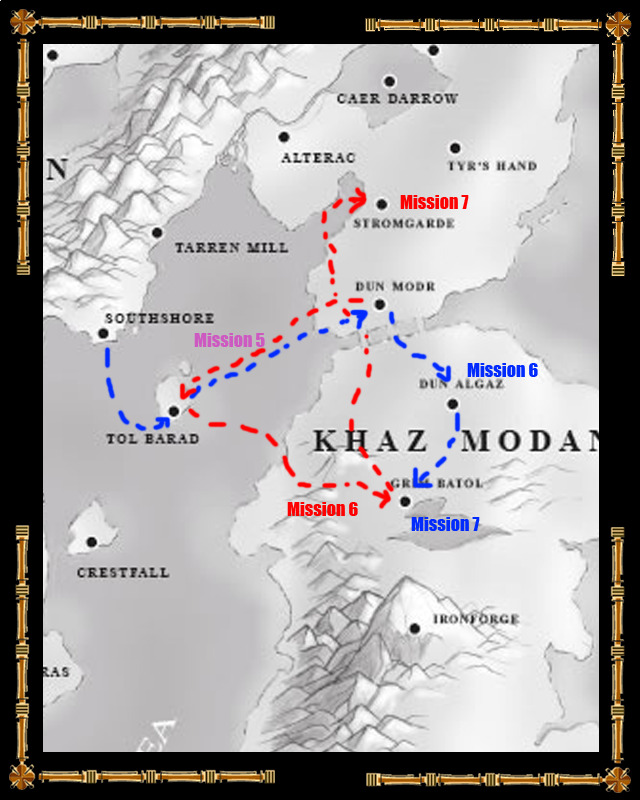 And so concludes our chapter in Khaz Modan. What does that mean? It means it's time we push up into the northern-most lands in Act III: It's Raining Fireballs and Elven Tears! It also means we're treated to another cinematic.